A couple of pictures from the event held Yesterday with the children of the deployed soldiers of 3-10 BCT whose father or mother recently deployed to Afghanistan. Santa and Mrs Claus were invited to read the books "Courage by Bernard Waber " and "Over There by Dorinda Silver Williams " at the event and socialize, take photographs, dance and visit with the children and families at our main Army Community Service (ACS) center. The Event was organized by the Senior Spouses, Brigade Rear Detachment Command, with support from the ACS staff and us. 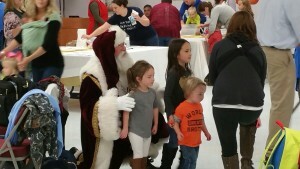 There were about 120 (+) children and family members at the event. Santa and Mrs Claus entered the room full of children and moms with bells ringing, and after a Boisterous Heaux, Heaux, Heaux. There was a brief moment of silence when we entered - they were very surprised to see us; seconds later the cheers, jumping and overall excitement began. We moved our way through the room to our couch and after small discussion read the book on courage. We then read the book Over There pointing out how courage plays a part in mom or dad being deployed. One interesting note is the kids did not know each other and one little girl excitedly exclaimed "My Daddy is in Afghanistan!" then the little girl beside her looked surprised and said 'My daddy is too!" this started a wave of excitement when they all realized they had something in common. We finished the reading and I broke out the Snow machine and we all had a jumping for joy in the snow - the kids really liked it as did the parents. 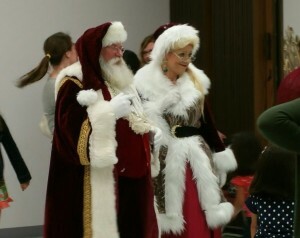 We then took a break for snacks and drinks and Mrs Claus and I mingled among the kids and parents discussing Christmas, the deployed Soldiers and things to do before Christmas. Then the event had a puppet show and the puppets talked about Afghanistan, deployments and homecoming special events. 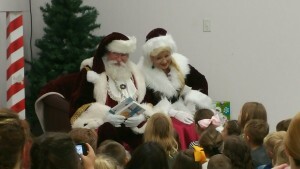 After the Puppet Show Mrs Claus and I sat for pictures with the families to send to the troops. They had queen sheets there for the kids to put a handprint on and sign their name, post a message , the sheets will be sent to the Brigade in Afghanistan along with the photos. In between families we did some dancing with the kids then took more pictures. As they event wound down we said our goodbyes and gave out a copy of the books to each of the children along with Letter writing kits. It was a good day, the kids were great and it was a pleasure to be with them, God Bless Our Soldiers and Families!